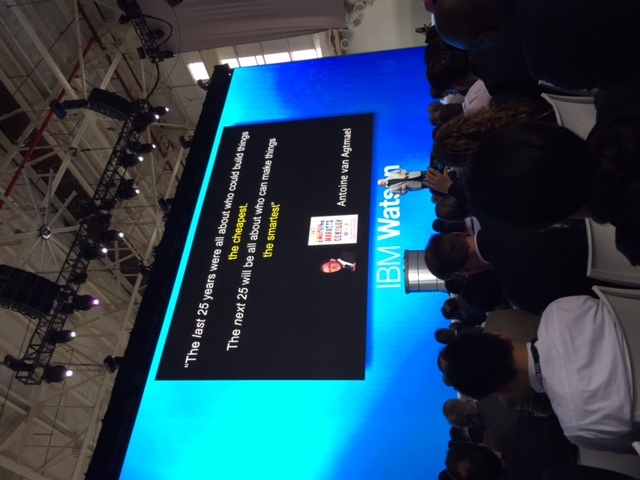 This is a live post from the World of Watson conference, hosted by IBM Watson. Keeping data local is key. Watson will offer a hybrid cloud. Watson Explorer will reside on premise, accessing local data securely, but also using the Watson cloud for public source feeds and computing. Mike reports on the 200 developers here for the parallel Watson Hackathon. “They have emerged with a really impressive set of apps; judging went late into night”. Fetch won with a query response system; second one targeted at NYC parents to ID schools a good match for their kids. Winner: LikeMinded, to find people worth connecting with based on geo-location and personality fit. Terry says he has disrupted travel twice and plans to do it again. Technique follows technology. We can’t know where technology will take use. Bell thought phone would be a tool for the deaf, for example. No one understood, early on, that Internet would be bank, travel agent, and love match-maker. Inventor of cell phone could not anticipate the billions in use today. Lesson: cannot know where tech will take us next. In early days of web, info flow was unidirectional, from provider to consumer. Today, the exchange is two-way and more immersive with ubiquitous connectivity.Users started creating information and they started selling, 18k travel agents disappeared overnight. Today, social feedback is hugely important. Two-way, social features has shifted power from central marketing departments to consumers. It changed amount of date from a stream to a torrent. The excitement of Watson is the ability to bring together clould, huge data streams, mobile, and human element. Terry thinks this will disrupt businesses. We’ve mofe from Systems of Record, to systems of engagement, to systems of insight. Watson allows the third wave of providing insight. The complexity of the world today is a big opportunity: how do we make it simple. That is where cognitive computing plays. In travel, booking is easy but planning is hard. The availability of huge amounts of information means people spend more time planning travel today than they did pre-Internet. “Search is great but only gives clues.” There are 58M “best hotels in Hawaii”. We need advice, not just search results. “Many big innovations effect only one part of the model.” Travelocity just sold differently, it didn’t change travel industry. Apple didn’t change music, it just simplified selection and delivery. Lesson: disruption starts happening with small steps. Terry’s Watson planning service, Wayfarer, allows users to ask questions and delivers answers, not just search results. These are baby steps. But what comes after baby steps. You have to look for what is immediately apparent. At Saber / AA, Terry said we can get rid of paper tickets – electronic would be good. AA was among last to implement but today, 99% of tickets are e-tickets. Lesson: in real innovation, being comfortable is bad. You need to be a little scared to move forward. Innovation requires being agile. You need tight feedback loops to take customer input and act on it. At Kayak, Terry forwarded customer email directly to engineers. “Give the feedback to those causing the pain.” The market creates feedback loops on business models. Terry relates evolution in travel industry and moves by airlines (to cut fees) and new players (to add fees or change features). In travel, says Amex and Carlson Wagonlit failed to transform, and allowed the Travelocity’s of the world to succeed. A key issue in transforming is having clarity and focus. You can’t transform by committee. Watson started with Q&A but now offers much more. You can’t just use Watson to re-create the past; it’s an important to re-imagine business. Example of this: envision 3D printing as additive, not subtractive (which is how most had viewed it).